Do you have a tall dog? Does it meet the requirements to fit in an extra-large crate except that your dog's head or ears touch the ceiling of the crate? The 500Plus Kit is what you need that will address this problem. This extension will keep your crate in compliance with IATA regulations and airline regulations. 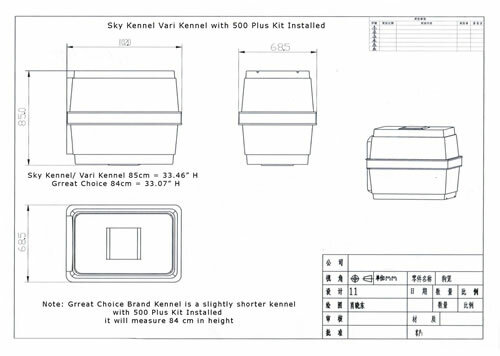 The 500Plus® Kennel Extension Kit will add a little more than 3 inches to the height of your existing Sky Kennel XL, Vari Kennel XL, or Grreat Choice XL. As an example, if your Sky Kennel crate outside dimensions are 40"L by 28"W by 30"H, then adding the crate extensions will bring the height to 33.5". Note that the extensions do not affect the length or width of the crate, only the height. You should always confirm with your airline that your pet's crate will fit in their cargo opening. This is very important as not all aircraft can service this size pet crate. Note the return policy at the end of this page. How will the door that comes with your crate fit with the new extensions? Problem solved: this product comes with another door that will fit with the extensions! The extensions are all installed easily by hand; no tools or hardware are needed or required. Simply add the two metal rails in between the top and bottom of the crate, install the new bigger steel door, and thread the provided 5.5" bolts with metal washers through the existing kennel bolt holes and secure with the reinforced Metal Thumb Nuts. Everything you need to install the extensions are provided in the kit. The 500Plus Kit Does NOT include an extra large pet crate. If you have carefully measured your dog and need this size crate, click here for the extra large pet crate. The extension kit will add about 11.5 pounds to the existing XL Kennel weight (27 pounds) for a total of 38.5 pounds. This kit will not work on older crates with square doors. Before getting this extension kit, you must confirm with your airline that your pet's crate, including the extensions, will be acceptable for the cargo opening on the aircraft that serves your specific route. This is extremely important!! Perfect for our Labradoodle's supermodel long legs! Our sweet Labradoodle, Barkley, has a thin build with supermodel long legs. Our family moved to South Korea for a military assignment and we were met with the dilemma of finding a safe crate to transport her that fit her body type. Due to recent pet flight restrictions, we had to ship her separately from our flight in cargo, so we were very nervous and anxious that she had something safe that fit her. This crate extension was perfect for us! It helped get our pup the crate she needs, tall, but not so big that she wouldn't feel secure. A world class product for our world class pup! 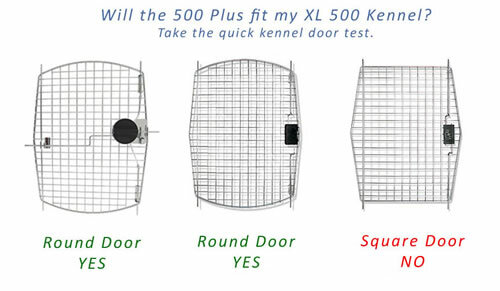 I purchased the xl kennel extension kit. I have a 60 pound mixed breed dog and flew from the US to Germany. The kit made his kennel tall enough to meet the height requirement of 3 inches taller than the highest point on him. The extension kits are heavy duty and sturdy and ship quick. This was delivered very quick . Did have a small hole in box. But no damage. Recommend maybe a foam on top. I would actually buy the crate and extension if it was put together. Found most crates are warped made it really hard pushing and pulling. The bolts could be a little stronger. Recommend try selling to the Navy Exchanges. Especially overseas where we get animals and must ship back to States. The construction could be more durable and it didn't seem to line up with the airline approved crate. Its really expensive for the quality. Sorry that you are disappointed with the extensions. We've used as well as other customers on close to 200 transports and have not had an issue with them. It sometimes takes some finagling to get the holes to lines up completely with the crate depending on the type being used. The PetMate SkyKennels and VariKennels are a direct fit based on the installations we've completed. We can accept it back for a refund if you wish to return. I added this to a new SkyKennel XL. The metal extension was larger than the crate so it was hard to install. Also the crate does not have as many holes as the extender really needs, so it is not tacked down well. I am really hoping the airline personnel do not have a problem with that. There were no real directions, just a photo, so I had no idea why the plastic screws were included. It might have made the installation easier if I had screwed the extender together with them first. I don't know. But I can't use them now that it is in. The people at the PetTravel Store answered my phone call and had me email them photos. They were very conscientious in getting answers from the manufacturer. This did a great job of accommodating our dog, who is a bit tall but not otherwise large, in a manner satisfactory to the airlines, without using a crate that is too big for many airlines. The construction of the extender seems solid enough to potentially outlast the crate.